The english name of this fruit is "hog plum".It is known as "ambado" in konkani,"amra" in bengali and "junglee aam" in hindi.This is a rare fruit which is used only in some parts of India.It has got a tangy taste.So a combination of khatta-meetha makes it taste yummy.This dish is known as ambadyache raite in konkani..
Wash the plums and peel them. Boil water in a pot and put in the plums.Cook them till they are soft.Dont discard the water, as you can use it for grinding in the next step. Grind together grated coconut,green chillies with the above remaining water. Heat a pan and transfer the ground mixture to it. Add jaggery and salt to this mixture. Put in the cooked plums and let them simmer in the mixture for about 2min. 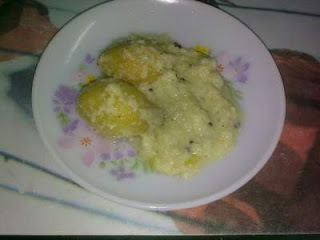 Give a tadka/fodni of hing and mustard seeds in 1tspn of oil/ghee to the above mix.